The Russian president has announced a campaign to repatriate Russian companies from offshore havens, and attacked “genderless and barren tolerance" in the West. President Vladimir Putin blamed the country's economic problems on unresolved issues at home, rather than external circumstances, the first such admission from the Russian leader since the Russian economy began to slow down. In this year’s annual address to the Federal Assembly on Dec. 12, Putin proposed a stricter system to repatriate Russian money in offshore havens. Reducing the Russian economy's reliance on offshore havens was one of the central objectives of the government's economic policy, along with such traditional elements as improving productivity and fostering innovation, he said. Companies registered in foreign jurisdictions must be stripped of their right to receive government support and bid for government contracts, the president added. Putin began his annual speech by criticizing – without naming any names - poor implementation of a series of his social policy decrees issued when he began his current term of office on May 7, 2012. “It has been a year and a half since those decrees came out," the president said. "But you know what I am seeing? Either they are being implemented in a way that only angers the public, or they are not being implemented at all." Andrey Chernyavskiy, a senior fellow at the Higher School of Economics in Moscow, said that the president’s initiative is sound in theory, but he does not quite see how it can be implemented in practice. Putin also called for the country “to turn towards the Pacific.” His proposals include establishing a network of special economic zones in the Far East and eastern Siberia with incentives for new businesses that do not merely exploit Russia’s natural resources. Russia also needs tighter controls on immigration, he said. He spoke of possible new legislation under which companies and individual entrepreneurs would need to buy special permits to hire foreigners. The price of these permits would be determined by the issuing regional authority, and the permit would only be valid in the region where it was issued. Putin’s speech contained strong words about what he called the "so called tolerance, genderless and barren” in the West, and about the erosion of traditional values. In his opinion, in many foreign countries there is now a compulsory requirement for the public "to pretend that there is no difference at all between good and evil.” He described the erosion of traditional values as an anti-democratic process, which is being pressed on the public against the will of the majority of the people. Boris Makarenko, the head of the Center for Political Technologies, said he was dismayed by Putin’s remarks about values, which preceded the foreign-policy section of the address. "These remarks used the kind of language that people in the West stopped using several decades ago," Makarenko said. Outlining the challenges facing Russia on the international arena, Putin emphasized that the global military-political, economic and information competition is becoming ever more fierce. He said he believes Russia must claim a position of leadership to defend international law and uphold respect for national sovereignty. “In recent years we have seen several examples of attempts to impose an ostensibly more progressive development model on other countries. In practice, these attempts have led to regressive, barbarian outcomes and bloodshed,” Putin said, referring to recent events in the Middle East and North Arica. “In Syria, the international community has had to make a fateful choice: Either we slide towards further erosion of the foundations of the international system, to the principle of might makes right and to the proliferation of chaos - or we make responsible collective decisions," the president said. From Syria he moved on to Iran, stressing that the country has an inalienable right to develop nuclear energy. He added, however, that all the Middle Eastern states must have guaranteed security. “Incidentally, the Iranian nuclear program was used back at the time as the main argument in favor of deploying the missile defense system. Now the Iranian nuclear problem is receding, but the missile defense system remains. 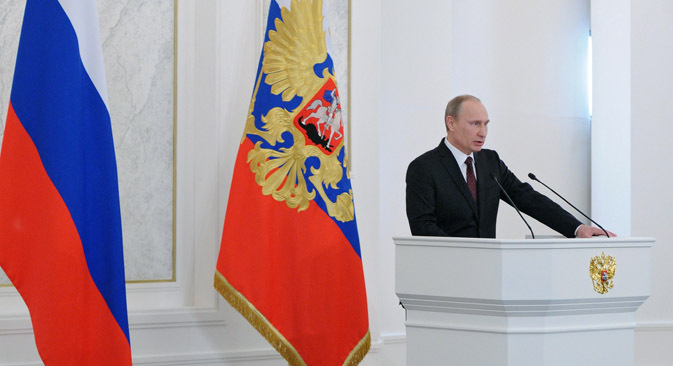 In fact, that system is being strengthened even further," Putin said.